Another delicious recipe from our friends at The Mistley Thorn, this creamy zabaglione semifreddo offsets the tart and floral gooseberry and elderflower compote to make a perfectly balanced dessert. Semifreddo is Italian for semi-frozen dessert. It can be made in advance and makes an impressive dinner party dessert. Whisk together egg yolks and sugar in heatproof bowl, place over simmering water (bain marie) and continue to whisk for 5 minutes. Gradually add the marsala wine, whisking all the time until mixture has doubled in size. Whisk the double cream until stiff and fold into the cooled egg mixture. Line a 15 x 10cm bread pan or silicon mould with clingfilm and pour in the zabaglione mixture. Freeze overnight. Put the gooseberries in a pan with the sugar and water. Add the elderflower cordial, tied into a strainer or muslin. Bring to a simmer and cook gently until the gooseberries are soft – about 10 minutes. Leave to cool, then remove the elderflower. To serve, arrange a slice of semifreddo on a chilled plate. 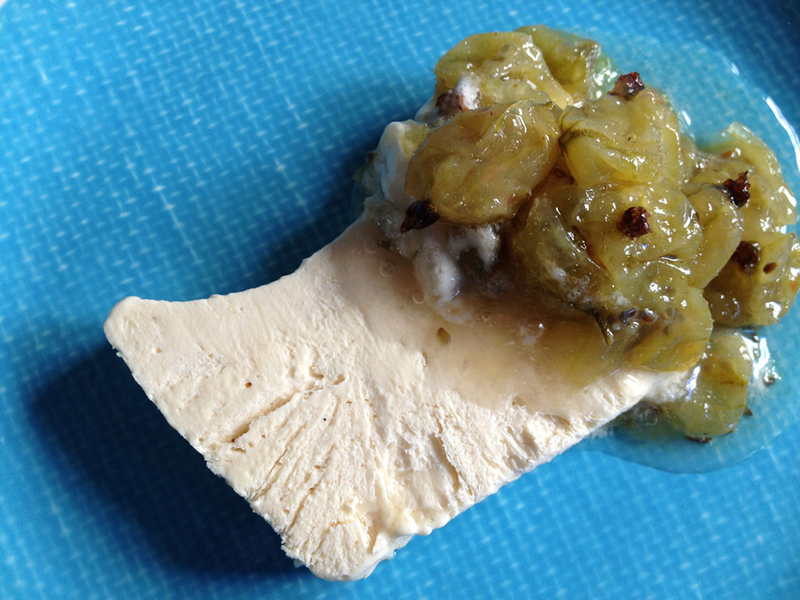 Spoon some of the gooseberries over the top with a bit of the juice. Serve immediately.